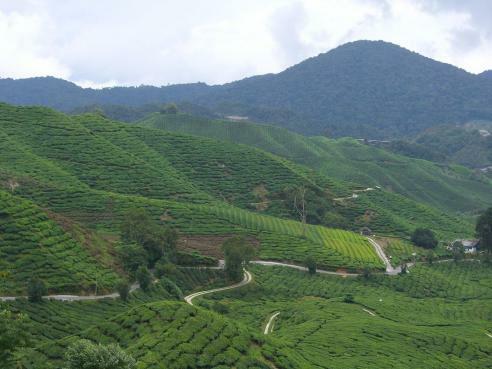 We were pleased to leave the hot and hectic kuala Lumpar and head up into the Cameron highlands. the last hour of the bus journey was steep uphill and?extremely?windy, testing even the strongest of stomachs. It was really beautiful. the area is famous for its tea plantations, which line the hillsides with rows of lush green. It's also much cooler at this height, making it far more comfotable to explore. We had?an amazing lunch in the town of Tanah Rata, where we are off banana leaves. We only had one full day here and spent it taking a bus to visit one of the tea plantations. we walked a few km's to get to the farm where we looked around the factory and saw the tea being made. It smelt amazing, we even tried some of the teas. I thought it probably wasn't a good time to tell them I dont like tea so knuckled down. Just time afterwards to pop into the bug and butterfly farm down the road. There were some stunning huge butterflies and some?bizare supersized bugs - It gave us a taster of some of the beasts we might encounter in the rainforest! Every night here there was the most ferocious monsoon rain, making the most incredible sound on our tin roof as we slept.